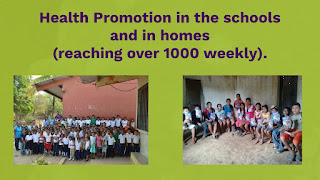 The promotora (Spanish for health promoter) model has often been applied in the United States and Latin America to reach Hispanic communities, in particular. Health promotion has been defined by the World Health Organization as "the process enabling people to increase control over and to improve, their health" (World Health Organization, 1997). 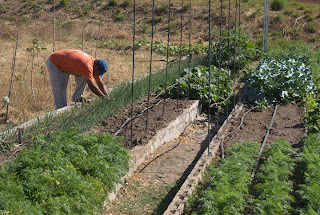 As a process, health promotion is not a means to an end, but an activity “directed towards enabling people to take action” (World Health Organization, 1997). Health promotion is done with people and not to them (World Health Organization, 1997). 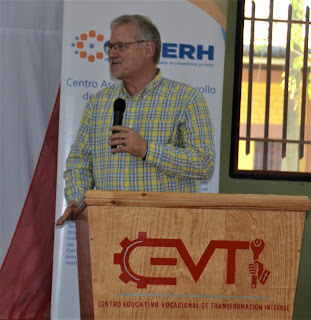 Larry's former academic adviser at Ohio State University, Dr. Jamie Cano, oriented him to the health promotion model and we have been using it in our community development work in Choluteca. Our health promoters are from the local community and teach members of the same community. 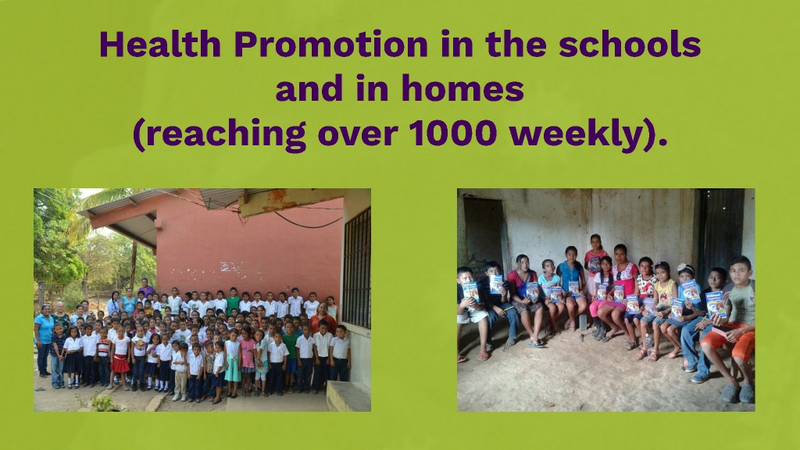 Our community health promotion program has prepared promoters who are teaching Bible-based health classes weekly to over a thousand students in private and public schools. Additional schools have asked for us to help them as well. 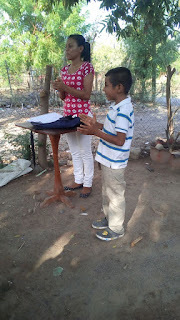 Also, our health promoters use Community Health Evangelism materials (https://www.chenetwork.org/) to give health classes in 80 homes each week. Health Promoters have a positive effect on impacting health outcomes by building partnerships and coalitions in communities (Balcásar, Alvarado, Cauntu, Pedregon, & Fulwood, 2009). "Apart from serving as effective conduits for health education dissemination and outreach work, health promoters can also serve as researchers, carrying out research functions such as project conceptualization, assessment tool development, data collection, and information analysis. In any research project, health promotors should not merely be asked for assistance with data collection but should be part of the entire research process from conception to dissemination" (Nelson et al., 2011, p. 681). This program has run out of funding from the original grant that was used to start it. We are temporarily operating the program with extra donations that come into our account. It costs $90 a month for each health promoter. We currently have 7 health promoters and would like to enter a new community with three additional promoters beginning in 2019. (Give on-line). David Hawk speaking at last year's graduation. 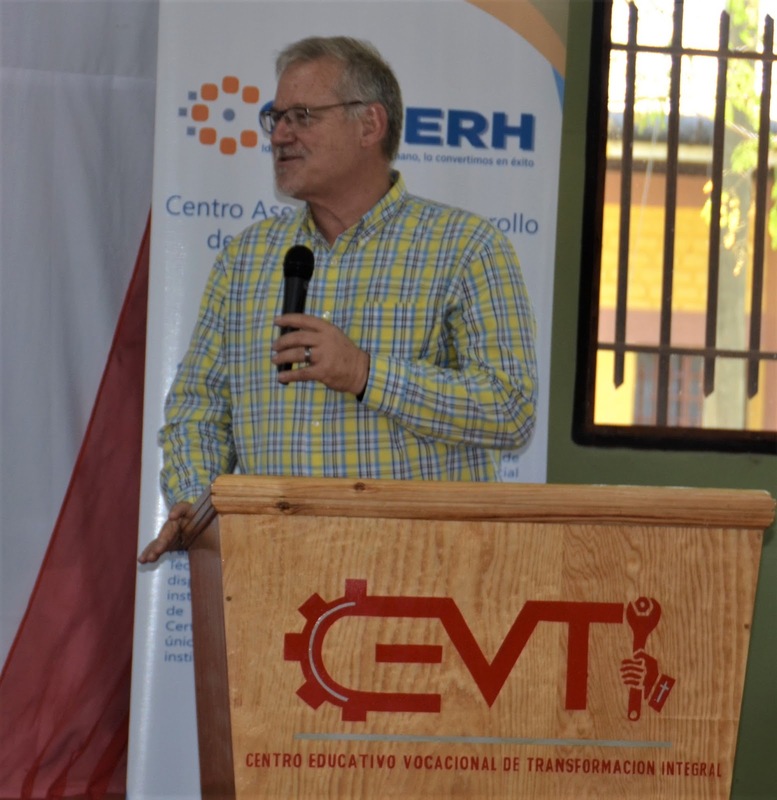 A word of Testimony from David Hawk: "I had an opportunity to witness first hand the impact our health promoter teams in southern Honduras have on the local communities. These are not people with years of education or special gifts, but simply neighbors. They live and work in the community, go to church there, their children go to school together. What is so special is that they have taken the tools given to them, and are using them to improve the health, social conditions, and talking about Jesus with anyone that will let them pass their knowledge along. The day I saw them in action we were evaluating ministry impact. Nineteen women and one man assembled to describe how knowledge shared by Pati Rodriguez and her team of community workers had changed their views on health, economy, relationships, and about God. They understand their value before God and understand their place in God’s plan. This team of promoters works in schools to instill a Biblical worldview in children all through elementary school. They do this with more than a thousand children on a regular basis. I walked by a class of 2nd graders and heard them singing together and responding to questions about the Bible. We don’t always have the chance to share the Gospel with adults, but children take the Good News into their home and plant the seeds of the Gospel. They are called health promoters. But in this case, they are more than promoters of physical health. They promote spiritual, emotional, intellectual, and physical health from a Biblical perspective. In short, they are discipling a nation."